Featured: * * * * * Winner of "Best Parenting App" three years in a row 2010, 2011 and 2012 (2nd), via BestAppEver.com * * * * * Selected for AppStore "Busy Parents" essentials * * * * * Featured on NBC Today Show, CNET Top5, AOL ParentDish Top 10 parenting app, CNN-Money. 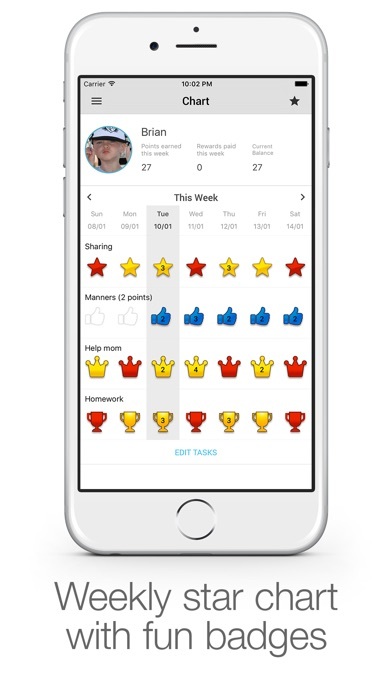 -------------------------------------------- About: iRewardChart makes it easy to reward your children for good behavior and keep them motivated. 1. Type their name, 2. Select a few tasks from our list of suggestions, and 3. Reward their accomplishments with a single tap in the weekly chart --------------------------------------------------------------------------- When stars have been earned, your child can pick from the default list of suggested rewards, or you can setup your own custom rewards especially tailored for each of your children, like "$2 Pocket Money" or "One Hour Of TV". Children love to feel responsible, challenged and respected. But most children don't like being told what to do... iRewardChart also allows you to set up abstract goals like "Patience" and "Sharing With Others", so rewards teach the virtues you want your child to learn. --------------------------------------------------------------------------- iRewardChart includes a backup and sync service, so that parents and children can share their chart across the devices. Our sync services is FREE to use, and uses Dropbox, which is also free. "iRewardChart" is a full featured free version with only the following limitations: - It supports a maximum of one child. 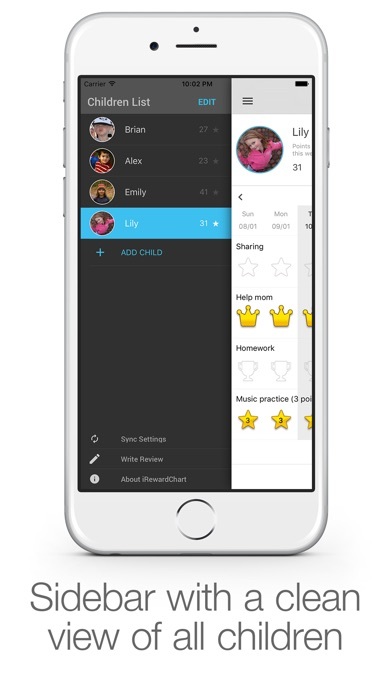 - It supports a maximum of four tasks per week Please consider buying the in-app Premium Feature that allows unlimited children and tasks if the basic version is helpful to you. 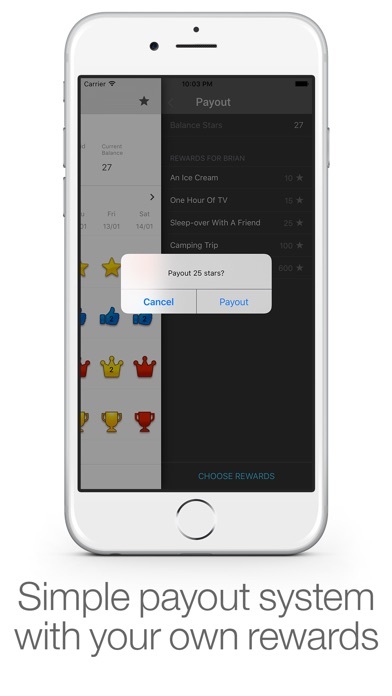 I was excited about the app, bought it for 2 devices, and spent time customizing the goals and rewards. The problem is that the number of points awarded and number of rewards paid out don’t accurately reflect what we have done. Very frustrating! We ended up adding things on our own so a paper chart would have been easier. I reached out to customer service twice but didn’t get a response. The concept is great but this glitch makes it useless. So far, I like the app. I wish it had option to deduct points in different categories. I’d also like to see it track weekly progress that highlights strengths and weaknesses. Also, it would great to link this with my sons iPod so he can track it but can’t do anything on it. Just a few thoughts. Easy to use and motivating to the kids. 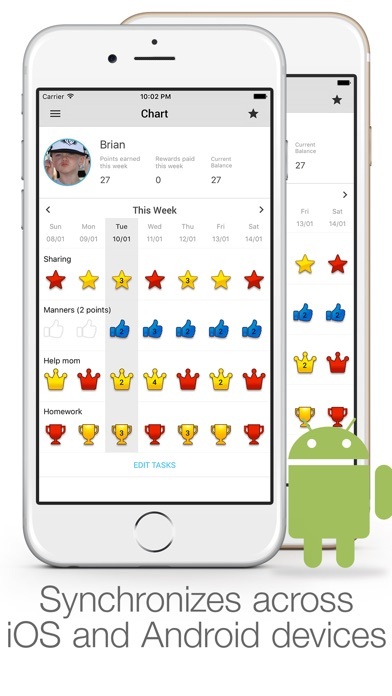 Will like it more if I was able to share app with kids so they can have app on their tablets and were able see their points but not able to add stars. Both my children have phones and i would’ve liked it if they were able to have app only to see their points to keep them motivated. There is a coding bug that always changes your stars/points. Whenever I go onto a week and then leave, it totally changes everything! It ruins the point! Also, you can only add 4 tasks before it tells you to buy more tasks and you can only add one child before it tells you to buy more. To buy it asks you to buy a whole premium set then get it for $3.99. It is a waste. this app is a LIFESAVER. i don’t know how i loved without it before. it makes spending time with my 18 year old boyfriend so much easier and he responds really well to the reward system. such a great and encouraging app to use. This is a great tool for helping motivate our kiddos so that we are encouraging good behaviors. We also love the customization and syncing features. A definite family must have. This app is super helpful. The $3.99 premium price isn’t too bad for what the app can do. 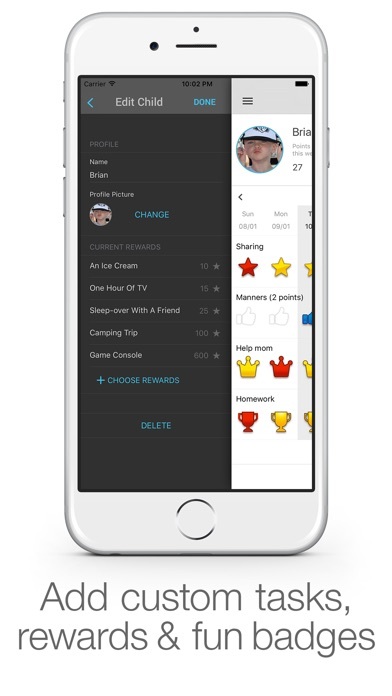 Customize behaviors, points, rewards, etc. However, this would’ve been 5 Stars if the developer was not trying to make me pay $3.99 for every device I use that’s signed into my Apple ID. I understand why, but I can’t bring myself to upgrade to premium on my wife’s phone and both our iPads when they’re all signed into the same account.